This issue occurs because Ubuntu 13.10 ships with PulseAudio 4.0 and Skype doesn't properly support it yet. A. 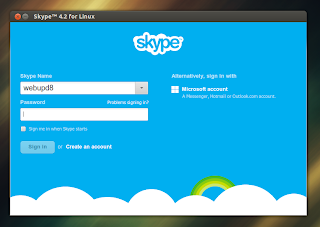 Install Skype from the Ubuntu 13.10 (Saucy Salamander) repositories, which comes with a fix for this issue. This is the recommended way of installing Skype in Ubuntu since it usually comes with extra fixes that aren't available in the deb downloaded from Skype's website. B. If for whatever reason you don't want to install Skype from the Ubuntu repositories, you can apply a fix to the Skype version downloaded from its official website. If you want to launch Skype from a script or add it to Startup Applications, use the following command: "env PULSE_LATENCY_MSEC=30 skype" instead of "skype".